deal should mean I can take care of me self. Derrick McReary (Irish: Darragh Mac Ruairi) is a character in the HD Universe appearing in Grand Theft Auto IV and The Ballad of Gay Tony. He is a 52-year old member of McReary Family and the oldest sibling of the five. He seems to be the most compassionate of all the McReary children, as is shown with the way he tries to calm down and negotiate with the bank staff and customers during the heist. Derrick wanted the money from the bank heist to be sent back to Ireland in order to help the "cause" (was most likely going to be given to the Real IRA to purchase weaponry), however Packie refused to let him do so, saying that the cause was over. 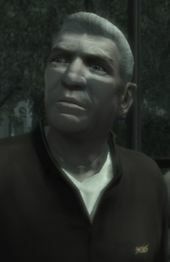 When his brother, Francis, discovers that Derrick has returned to Liberty City, he worries that he will reveal Francis' corruption to the press for money. He talks with Derrick in a park, as part of an attempt to use Niko to kill him, thinking that he must go outside the law to take down his brother. Niko has a choice of who to kill. The player does not receive anything from Derrick for killing Francis. In Grand Theft Auto V, set in 2013, Packie mentions that Derrick is dead if he is brought along on a heist. How or when Derrick died is not elaborated on, though it can be assumed that he was either shot by Niko, or he at one point died of an overdose due to his drug-addiction, in the five years between the two games. Derrick's portraits are hung on the wall inside the Steinway Beer Garden and Lucky Winkles bar. This probably means that Derrick is in some way an idol or emotive symbol to the Irish Mob due to his past. If he was killed in the mission "Blood Brothers", his tombstone at the Steinway graveyard like his brothers, but with the gravestone stating; "Here lies Derrick McReary, Brave, Honest, Shot Dead". If Derrick did succumb to his addiction to heroin, he would be one of the few characters in the Grand Theft Auto series to die of an overdose. Much like Ashley Butler if she is not killed by Trevor Phillips. Concept artwork of Derrick McReary for GTA IV. This page was last modified on 20 December 2016, at 01:28.